The latest in a long line of random stuff popularized by the famous and semi-famous and supposedly famous on Instagram: Pool floats. And, FYI, we’ve reached the lawsuits portion of this particular trend cycle. Pool floats aren’t some new concept, and this trend (like all trends) took a couple of years to percolate. (Exhibit A: Jenna Lyons on a swan float at Soho House in 2013.) But they became A Thing last summer, when they started popping up like mushrooms after a rain on social media posts from celebrities and who-lebrities alike. Swan floats specifically were, for instance, a prominent feature of Taylor Swift’s 2015 Fourth of July party, and an Instagram shot of herself and Calvin Harris was an early confirmation of their relationship. (It’s since been deleted.) “Turns out, the float is manufactured by Swimline Corporation and has blown up in sales over the past three years due to celebrity exposure, the company’s national sales manager Kieran Glackin tells PEOPLE,” the magazine explained. In fact, Reese Witherspoon seems to buy every novelty pool float that floats onto the market. And so over the last year, the trend has trickled down to us mere normals, even as the options have expanded, turning pool floats into a hot market opportunity. Which always brings fierce business competition—at the higher end of the market, for instance, Bloomingdales debuted an $80 swan float as part of a home goods collection with Liberty London, and luxury float player Funboy offered on-demand float delivery to this year’s Coachella goers. In this particular case, however, the craze has also unleashed legal drama. Again, reminder, we’re talking about whimsical pool floats. BigMouth alleged the sellers made counterfeit goods and sold them under the BigMouth Amazon Standard Identification Number, attempting to pass them off as the real deal, according to complaints filed earlier this month in a Connecticut federal court. The differences between products are slight but noticeable to the discerning eye, BigMouth said, such as using less colors on the doughnut, not shading in sprinkles and using thinner plastic. The company also said the defendants used BigMouth product shots without permission. We might be talking about novelty pool floats, here, but BigMouth says it’s more than just financial small potatoes. BigMouth had been tracking alleged counterfeiters on Amazon for over a year, he said, but didn’t pursue legal action until losing the “Buy Box” to Floating Panda and SoloFleet for a doughnut float. The Buy Box is the place on an Amazon page where the customer selects “Add to Cart,” and being featured there ensures a steady stream of sales. Because multiple sellers deal in the same products on Amazon, the box is highly prized. Typically, the seller with the best price lands in the box. Wampold alleged the rivals undercut his price by a few cents, bumping him from the box. The move cost his company about $20,000 a day in doughnut floatie sales, he estimated. $20,000 a day! 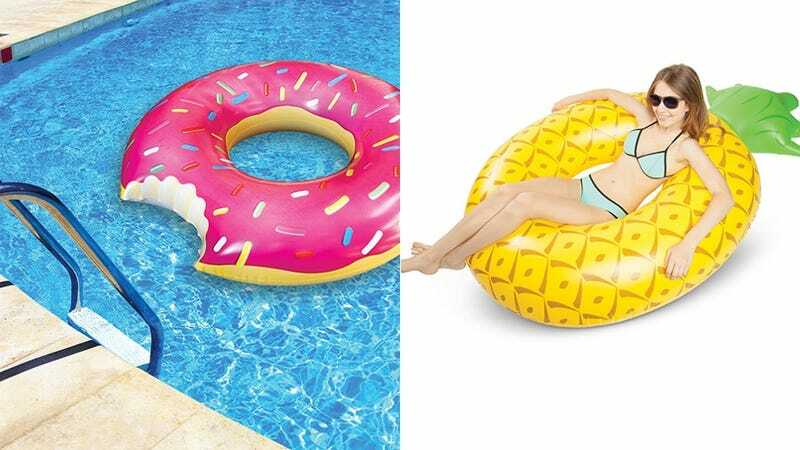 For pool floats shaped like doughnuts! All this despite the fact that these things are damned hard to get into without cracking open your skull on the side of the pool, they aren’t that comfortable, and hot plastic against your skin tends to chafe. Much like so many things to do with summer, pool floats look better on Instagram than they feel in real life.